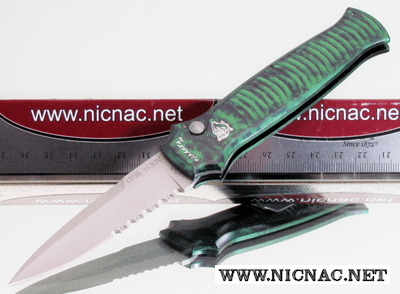 Piranha Mini Body Guard Automatic Knife comes with an anodized 6061-T6 aluminum handle, firing button on the front and a titanium pocket clip on the back for tip-up carry. The mini of the Body Guard series in the Piranha Knives line. The Overall open length of the Mini-Guard is 6.6 inches with a blade length of 2.9 inches and a great pocket carry closed length of 3.7 inches. Made in the USA.